Modern Art 2011: "Luxe, calme et volupte"
"Luxe, calme et volupte (Luxury, peace, and pleasure)" was painted by Henri Matisse from 1904 to 1905, oil on canvas, 37" x 46". 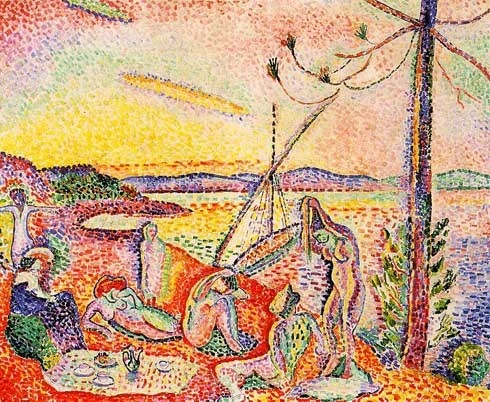 Matisse was a French expressionist painter. He painted this piece during the fauvism movement in France, as evident in the use of bold, brash colors and obvious brush strokes. In comparison to his other Fauve works, I find this one surprisingly detailed and smooth. The colors and brush strokes are clearly separate yet it's a very neat painting, with definitive and clear figures. The inspiration for this painting was a poem from Charles Baudelaire's volume Les Fleurs du Mal (The Flowers of Evil). I think the title really encompasses the feel of the painting.